Peru’s 2016 Elections: Will Old-timers Retain the Lead? The big surprise of Peru’s presidential campaign – for elections about four months from now – is that there have been no surprises. All three frontrunners in the April 10 first round are old-timers, not newcomers or outsiders. Although Peru’s political parties are among the weakest in Latin America, two of the three lead institutionalized parties. Further, in a country where the winners since 2001 have been roughly at the center-left of the ideological spectrum, all three of the current leaders are at the right or center-right. One is that Peruvian voters are reacting against the administration of incumbent Ollanta Humala. A former military officer, Humala burst into Peru’s electoral arena as a fiery leftist outsider in 2006 and won a plurality in the first round but lost the runoff. For the 2011 election, he moderated his positions considerably and prevailed. But his political party has remained inchoate and, in part as a result, Humala is now perceived as opportunistic and weak. Humala has delivered on promises of social inclusion to a degree, but economic growth has stalled – so Peruvians may now be reasoning that it is time to prioritize growth. Probably more likely, however, is that it is yet early in Peru’s presidential campaign. Even as late as three months before elections, Peru’s opinion polls are often very wrong, almost always exaggerating the support for rightist candidates. In January 1990, Mario Vargas Llosa was leading with 53 percent, compared to 15 percent for his nearest rival, but lost the runoff in a landslide. Lourdes Flores was leading in January 2006, and Alejandro Toledo in January 2011, but neither even reached the runoff. The current three front-runners have strengths, but also liabilities. The candidate who has topped the opinion polls for more than a year is Keiko Fujimori. She is the daughter of Alberto Fujimori who, despite conviction on charges of human rights violations and corruption, retains support as the president who presided over the decimation of the Shining Path insurgency. Her “Fujimorista Party” has a fervent base in both urban and rural areas. 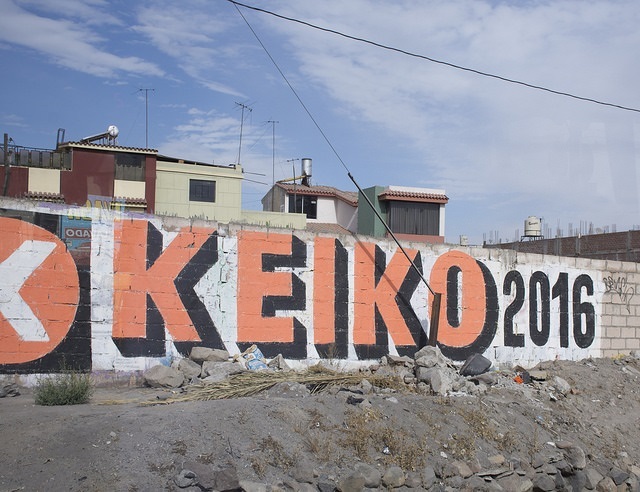 Keiko was the runner-up in Peru’s 2011 election, but she struggled to achieve a balance between respect for her father and distance from his abuses. She is likely to have the same challenge in 2016. Currently second in the polls with roughly 22 percent is Pedro Pablo Kucznyski. He can take credit for excellent economic growth during the Toledo administration (2001-2006), when he was economics minister and prime minister, and there are no corruption charges against him despite many years in government. In 2011, he ran an excellent campaign and finished third. But he will be 77 next year, and he has many U.S. business connections (and until now a U.S. passport), which could hurt him. Running third with about 10 percent is Alan García, the long-standing leader of Peru’s most-institutionalized party, APRA (American Popular Revolutionary Alliance). García is a brilliant campaign strategist, and he can cite superb economic growth during his 2006-2011 presidential term. However, he is also widely perceived as Peru’s most corrupt political leader. Surprises are inherently impossible to predict – but not impossible to imagine. Peru’s left is divided and poorly financed, and its heyday has probably passed, but the candidate nominated a few weeks ago by the Broad Front, Verónika Mendoza, a congresswoman from Cusco and psychologist who studied in France, has the potential to appeal to diverse sectors of Peruvians. As in many Latin American countries, corruption scandals are at the forefront in Peru, and a candidate who has participated in successful anti-corruption efforts – but whose name doesn’t occupy headlines – could emerge and turn the race upside down.